The spindle variety euonymus 'Emerald Gold' is a low, compact shrub with a bushy growth habit. It will grow up to 1m tall and does not grow particularly quickly (10-20cm p.a. ), making it perfect for low hedges. 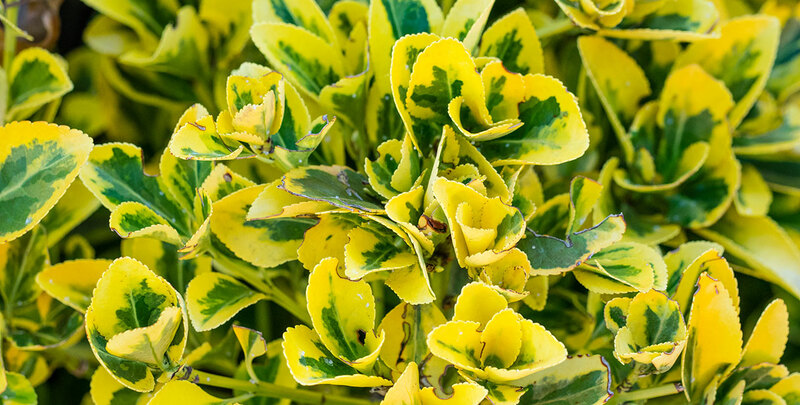 Emerald Gold is a variegated variety of spindle and features yellow-margined leaves. Euonymus 'Emerald Gold' is an evergreen shrub with discrete flowering in May and June. It makes an excellent alternative to the popular hedging plant box, as the latter is sensitive to box blight. The 'Emerald Gold' is fully hardy and will thrive in full sun or semi-shade. It is not picky when it comes to soil type: any well-drained soil will do. Euonymus 'Emerald Gold' is very low maintenance and easily trimmed. Trimming can be done in mid to late spring to stimulate its bushy growth.